Toggle buttons feel like a favorite way for devs and designers to show off their animation, design, and pun skills. There is even a Codepen collection dedicated to toggles. While I recognize that the bulk of these are fun experiments, experience has taught me that some developer somewhere will copy one of the experiments into a real user-facing project. These controls are overwhelmingly inaccessible and in many cases usability gotchas. For this post, I am only going to provide styles to visually convert a standard checkbox into a visual toggle. No ARIA, no script, no special features. A progressively enhanced checkbox that will continue to work if the CSS file does not load, following in the approach of my post Under-Engineered Custom Radio Buttons and Checkboxen . If you want to build a native-like toggle in function as well as style, then you need to look at the ARIA switch role, understand that a switch affects an application immediately, explain this to a user in plain text, and recognize that not doing this correctly could be a Level A WCAG violation. This pen shows the default checkbox from your browser and also shows the styled checkbox. This simple example does not show all the possible states and features that you should support. You may immediately notice that it does not look exactly like the iOS toggle people expect, primarily because some accessibility and usability best practices have been applied. I cover all those below and at the end of this piece is an example showing everything wrapped up together in a set of toggles. Visit the example pen directly if it does not load. As noted above, I lean on some existing code. I hide the checkbox without removing it from the DOM nor the accessibility tree. I use ::before to generate the pill and ::after to generate the thumb thinger. All sizing is done in ems so these will scale with the surrounding text. The gray (#767676) has a 4.5:1 contrast ratio with the white background while the green (#36a829) has a 3:1 contrast ratio with white. The selectors may look a bit verbose, but I avoided :not() as IE does not handle multiple selectors within it, thereby not shortening my code much. It is important to support keyboard users as well as touch and mouse users. Whatever hover styles you develop need to be clear and obvious when the user is tabbing through the page or focus is programmatically placed on the checkbox. I do three things here: I make the label text blue, I add a shadow to the entire pill, and I add a small disc to the thumb thinger. On their own each might be too subtle, but when used together my limited user testing told me they did the job without overwhelming the interface. Sometimes fields are disabled, and in native controls this is visually communicated by making them gray. Because there are no contrast requirements we have a little more room to play here. I honor the grayed-out approach by clearing the backgrounds and lightening the borders and text. While a disabled control cannot receive focus, it can be hovered so we want to undo those styles as well. Most examples you will find do not take this into account. Most developers I interact with do not seem to know this, and are startled when their framework of choice returns the occasional indeterminate checkbox (assuming they can see it for the styles that do not account for it). In this case, it is as simple as moving the thumb thinger to the middle and choosing a neutral background color. Because we address colors already for disabled checkboxes, we don’t need to do anything special for a disabled indeterminate case. If my user’s experience with toggle controls is primarily from iOS, then you may want to put the toggles to the right of the text, instead of to the left as I do here. Mostly it is a matter of adjusting the label text so there is room to the right, and then placing your ::before and ::after on the right, offsetting the thumb thinger as appropriate. The likelihood that the animation for the toggles will cause issues for some users is low. But there is also the chance the user scales the content so the toggle fills the screen, and at that size it could be an issue. Conveniently we can disable that animation with a feature query. Windows offers users a way to strip all the colors of a web page and replace them with a subset of user-defined system colors. You cannot define the colors, but you can specify which system color should get applied where thanks to keywords. Here we use a proprietary feature query and set all the colors that we need to convey the state of the controls. 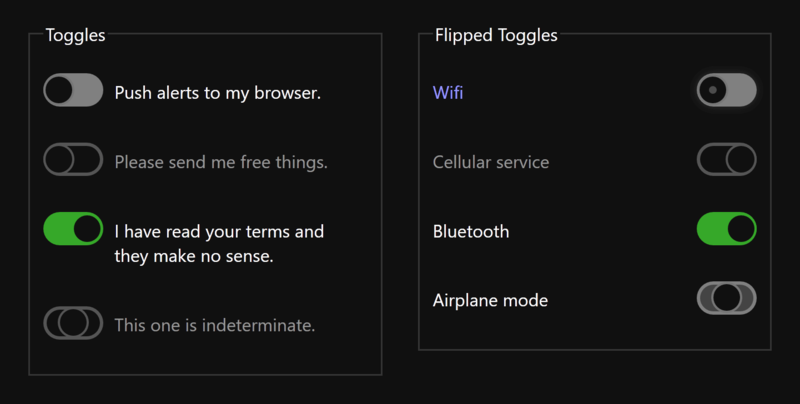 The toggles as seen in Microsoft Edge while running in Windows High Contrast Mode with the Wifi checkbox focused. In both Safari and Firefox pre-releases we have the prefers-color-scheme media query, which allows a user to choose to see a page that may have a dark theme. Honoring this is a matter of choosing good colors with good contrast. In my example, I reset the form to nearly black (#101010) and the text to white. The green still has good contrast (6.2:1), but I need to change the blue for the focused/hovered text and I change my border and background to a bit lighter (#808080) to get a 4.8:1 contrast ratio. You can see some other tweaks for the disabled and indeterminate states and the SVG I use on focus/hover. 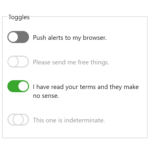 The toggles as seen in Firefox 67 (Developer Edition) while running in dark mode with the Wifi checkbox focused. Let’s not forget that sometimes content we write gets auto-translated into other languages. Sometimes those language are not a Western language like you are reading right now, but might be a right-to-left (RTL) language like Arabic or Hebrew. If you are tweaking this code to use in a library of your own that might be deployed outside of your site, it may end up in a language you did not anticipate. While I may not know Persian or Urdu, I can ask around for someone who does know a RTL language and confirm some assumptions. Mostly we know that not only does the text direction change, so does the toggle direction. So we have to flip everything for it to make sense. If context warrants a swapped toggle and text (such as native applications), then we have to flip that as well. When we pull all that code together we can have a robust set of toggle styles that can adapt to user preferences for text size, contrast, language, motion, and interaction mode. As more features become available to us to honor user preferences and platform features, then we can fold those in as well. Working in IE11, Edge, Firefox, Chrome, Safari. I considered making that a toggle checklist, but that seemed unnecessary.